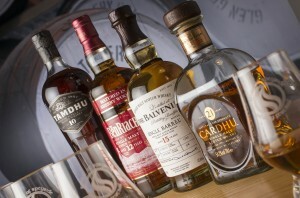 May 8, 2014 – The Spirit of Speyside Festival has honored four Speyside single malts in its annual whisky competition. The winners were decided by public votes during a series of tasting and judging sessions around Speyside during the festival from a group of short-listed finalists determined in pre-festival judging. BenRiach’s 12-year-old Sherry Wood malt took top honors for whiskies 12 years and younger, while The Balvenie’s 15-year-old Single Cask won for malts 13 to 20 years old. Cardhu 21-year-old won in the category for 21-year-old malts, while Tamdhu’s 10-year-old won the award for best distillery limited edition. Nearly 350 people voted on the eight finalists during the tasting sessions, and in a change from tradition, the awards were presented on Sunday night during a closing-night ceilidh at Glen Grant Distillery. In previous years, the winners were determined by voting at a banquet on the festival’s opening night. The 2015 Spirit of Speyside Festival will run from April 30-May 4, 2015.